The last day of the 2013 Yonex-Sunrise Indonesia Grand Prix Gold was exciting even if every match involved team-mates fighting each other for the titles. 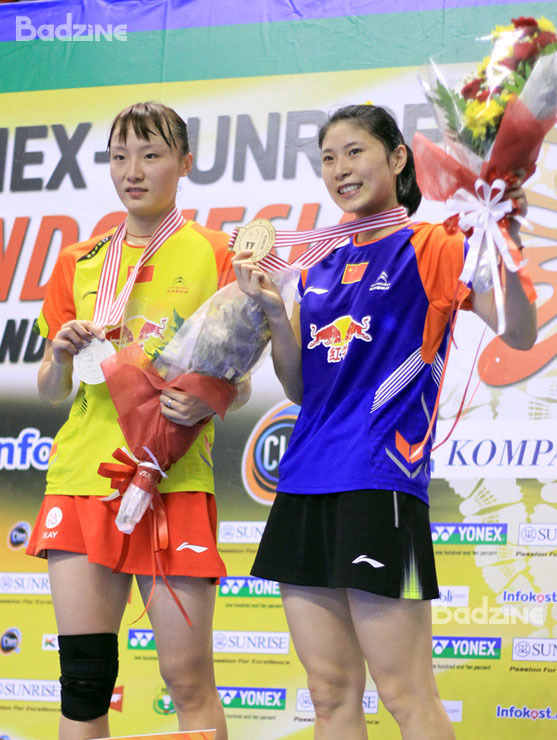 In the longest match of the day, Chinese twins Luo Ying and Yu won back the title that was last theirs in 2010..
By Mathilde Liliana Perada, Badzine Correspondent live in Yogyakarta. Photos: Ira Ratnati for Badzine (live). Women’s doubles pitted 18-year-old Huang Dongping and 16-year-old Jia Yifan in a quite troublesome contest for their more experienced compatriots Luo Ying and Luo Yu. It was an exciting match full of beautiful strokes, strong defense, and long rallies and really brought the cheers from the crowd. The Asian Junior Champions fell behind in the first game but they were able to catch the twins late in the match to get the one-game lead. The Luo sisters rose to the occasion in the second and force the rubber game, which they also won to successfully win back the title that marked their first international triumph at the 2010 edition of the Indonesia Grand Prix Gold. “The crowd is very good. They were cheering throughout the match and it was very exciting to play here,” Luo Yu added. The women’s singles final but had a tighter finish. Suo Di dominated the first game but Yao Xue didn’t give up so easily. She tried to steal the second game but came up just short in the end and was unable to take her first international title. After their loss to Korea’s Kim/Kim in the final of the Indonesia Grand Prix Gold last year, Angga Pratama (pictured left) and Ryan Agung Saputra were hungry to become the champions of the same tournament this year. The #2 seeds were forced to three games by Ronald Alexander / Selvanus Geh (pictured below), who had already sent off both Hendra Setiawan / Mohamad Ahsan and Markis Kido / Gideon Markus Fernaldi. The Australia Open 2013 champions bounced back to win it 17-21, 21-15, 21-16 in 51 minutes. “I think we played our best but exhaustion affected our game,” Selvanus explained after the match. “I hope this title can motivate us to get better results in the next tournaments, in Denmark and France,” said Ryan. World Champions Tontowi Ahmad and Liliyana Natsir came to the tournament as the top seeds and overwhelming favourites to win. They were leading late in the first game but Praveen Jordan / Vita Marissa did not win two Grand Prix titles and reach two Superseries semi-finals this year by being pushovers. Unforced errors by the top seeds benefitted their opponents, who played safe at the end of the first game and scored four points in a row to win it 22-20. In the second game, Tontowi / Liliyana play tactically with many trick shots and won it easily but ultimately failed to defend their title as Jordan/Marissa stayed sharpest in the decider. “It was a difficult match for us because Vita and Jordan played well. Vita has good strokes while Jordan has a strong smash. Tontowi made many mistakes and unforced errors. This was another advantage for them,” said Liliyana Natsir. “I am the junior partner here. I play with no pressure and motivated myself to show my best performance. I just believe in myself and never think of winning or losing the game,” Jordan added. The men’s singles portion of the tournament’s US$120,000 in total prize money was the last to be divvied up. The third title for Indonesia went to Simon Santoso (pictured), who defeated 2011 champion Dionysius Hayom Rumbaka in straight games. “I was never under pressure in previous rounds because my opponents were not that dangerous. Physically, I am fit but mentally I am not because I didn’t get the feel of the game,” Hayom explained. “The key to my win today was motivation and desire to win the match. Maybe lots of people think that my time is over but I proved that I still able to compete,” said Simon. The Indonesia Grand Prix Gold did create a lot of surprises. The players are getting younger with the tournament getting better. The support of the crowds at the finals was sometime to cheer about. This does augur well for the future of the sport. Simon Santoso had proven that he still has in him the drive to win. He is sending out a signal to others that he is back on the winning trails. All the best to him!